Germany’s largest trade union, IG Metall which represents engineering, automotive, electrical, aerospace, steel and manufacturing workers is preparing to submit a 6% pay claim to German engineering employers – coupled with a claim for shorter working hours. 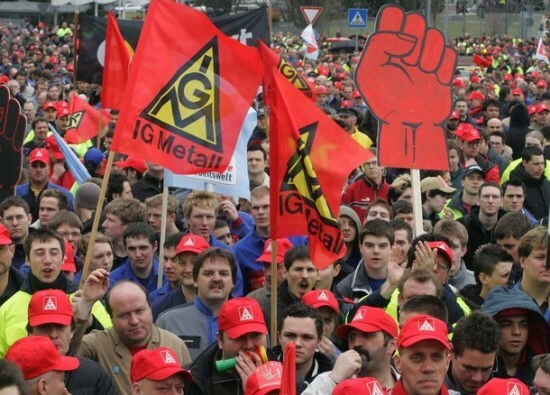 IG Metall negotiates a national sectoral collective agreement with the German metalworking employers organsiation, which applies across the board to almost 3.9 million workers. The claim for shorter hours is reported to be for a 28 hour week (down from the current 35 hours) in push for ‘better work life balance’. IG Metall is preparing for the effects of the digital revolution and automation which it is anticptated may eliminate many manufacturing jobs in the coming years. The demand also reflects a renewed confidence among trade unions in the EU and the expectation that Germany’s economy is expected to grow by 2% this year. “There is no reason for restraint,” IG Metall President Joerg Hofmann says, pointing to growth in manufacturing and industry and the German economy’s strong performance. In 2016, an increase of 2.8% was agreed in July 2016 – followed by a further 2% in April this year. Hofmann also called for a fundamental change in the way companies deal with the issue of working time. Workers now put a bigger emphasis on work-life balance and the demands for more flexibility from employers must be reflected in any wage deal, he says. IG Metall is seeking a right to reduce weekly hours to 28 hours from 35 hours — with a right to return to full-time work after two years for shift workers and those caring for children or relatives. IG Metall says its strategy reflects changing working preferences of workers who want more time off instead of more pay and time to care for their children or parents and to engage in communal work. The head of the employers association Gesamtmetall has rejected the demand for a 28-hour week, saying this would exacerbate shortages of skilled workers. The demands, presented by IG Metall’s board for the 2018 wage negotiations, still need to be approved by its regional branches in the next few weeks. The normal practice in Germany in the metalworking sector is for negotiations to begin in one region (usually where IG Metall is particularly strong) with any negotiated agreement forming the ‘template’ for the rest of the industry. This entry was posted in Economics, European Trade Unions, Media, The Digital Economy and Unions, Trade Unions. Bookmark the permalink.